FILE - A Yazidi man walks on the ruins of his house, destroyed by Islamic State militants near Sinjar, Iraq, Feb. 5, 2019. Ever since Islamic State visited death and destruction on their villages in northern Iraq nearly five years ago, Yazidis Daoud Ibrahim and Kocher Hassan have had trouble sleeping. "They burnt one house down, blew up the other, they torched the olive trees two three times. ... There is nothing left," the father of eight told Reuters. 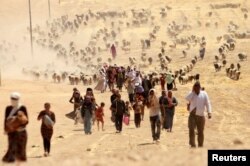 FILE - Displaced people from the minority Yazidi sect, fleeing violence from forces loyal to the Islamic State in Sinjar town, walk toward the Syrian border, on the outskirts of Sinjar mountain, near the Syrian border town of Elierbeh of Al-Hasakah governorate, Iraq, Aug. 10, 2014. "My sons built that house. I can't go back without them. ... Their school books are still there, their clothes," she said. "Life is bad. There is no aid," he said sitting on the edge of the collapsed roof which he frequently rummages under to find lost belongings. On this day, it was scarves, baby clothes and a photo album. "Every day that I see this mass grave I get 10 more grey hairs," he said. 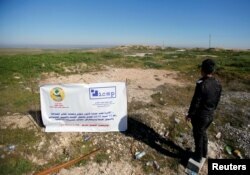 FILE - An Iraqi police officer looks at a Yazidi mass grave site near Sinjar, Iraq, Feb. 4, 2019. "I hear the cries of their spirits at the end of the night. They want to be buried, but the government won't remove their remains." They and their kin also want justice, Ibrahim adds. She doesn't know why Islamic State freed her and the girls, then aged one to six, and hasn't learnt the fate of the three remaining children: two boys Fares and Firas, who would be 23 and 19 now, and Aveen, a girl who would be 13. FILE - Yazidi women prepare bread at a refugee camp in Mount Sinjar, Iraq, Feb. 4, 2019. There is no electricity or running water in the camp where they live today. She doesn't remember when her children last ate fruit. "Life here is very difficult but I thank God that we are able to see the sun," she said. During the day, her children go to school and are happy, but at night "they are afraid of their own shadow," and she herself has nightmares. "Last night, I dreamt they were slaughtering my child," she said. "There is no protection. Those who killed us and held us captive and tormented us have returned to their villages," Khalaf, 40, said, referring to the neighboring Sunni Arab villages who the Yazidis say conspired with the militants. "We have no choice but to stay here. ... They are stronger than us."